An extraordinary album of etched furniture designs by Jacques Androuet du Cerceau, containing most of his known prints of this type, together with one unrecorded print, gathered and bound circa 1580. Until recently the album reposed in the extensive library formed in the 17th and 18th centuries by the Earls of Macclesfield at Shirburn Castle, Oxfordshire, unknown and unrecorded. Its recovery brings vital evidence to the study of the states and issue dates of Androuet du Cerceau's prints for furniture. Designs for furnishing, including cupboards and sideboards, tables, chairs, beds, pedestals for busts, caryatid and terminal figures, doorways, and a chimneypiece, cartouches and fleurons, seventy-three etchings altogether. 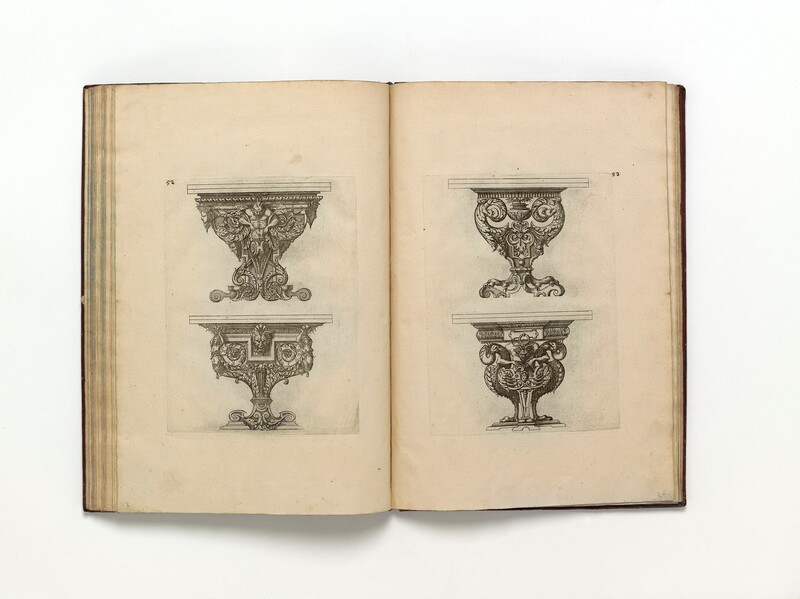 folio (320 × 220 mm), 66 leaves (numbered by hand 1–67, with folio 44 numbered on recto 44 and on verso 45), presenting seventy-three etchings by Jacques Androuet du Cerceau. collation forty-four prints are imposed in pairs on whole sheets of paper, gathered in quires, and bound in on their own paper; one print (cancellans [g]4) mounted by binder on the stub of the cancel­landum; eighteen prints mounted by binder in two quires of album leaves placed at the end ([i] and [k]); ten prints (on nine individual leaves, here designated π1–π2,1X1–7X1) interpolated by binder according to their subject: [a]8 [b]6 [c]6 [d]4 (+π2 after [d]2; Χ1, 2X1, 3X1 after [d]3) [e]6 [f]6 (+4X1, 5X1, 6X1 after [f]6) [g]4 (–[g]4, cancelled and7X1 substituted) [h]6 [i]6 [k]6.
paper the principal watermark is a crescent above a banner lettered j perret (30 × 40 mm; Briquet no. 5306),1 appearing in folios [a]1, [a]3, [a]4, [a]7, [b]4, [b]5, [b]6, [c]2, [c]3, [c]6, [d]2, [d]4, [e]1, [e]3, [e]5, [f]1, [f]4, [f]5, [g]1, [g]3, [h]1, [h]4, [h]5 (all whole sheets except [g]1); other watermarks observed: fragment of anchor? ([i]1 and [i]5), bunch of grapes (Χ1, binder’s guard), fragment of armo­rial (3X1), fragment of armorial with three fleur-de-lis and crown with shell border (4X1, album leaf), fragment of same armorial? (5X1, album leaf), post horn (6X1, album leaf); no watermark observed in conjugate folios [i]2/[i]5, [k]1/[k]6, [k]2/[k]5, [k]3/[k]6, π1/π2 or interpolated leaves 2X1, 7X1. condition short tears in folios 15, 27, 42 (all but one closed by the binder); prints on folios 27, 28, 42, 43, 44, 56, 58, 59, 61 trimmed along or within platemark before binding, then attached to binder’s guards or window-mounted; some light paper discolouration, otherwise in superb state of preservation. binding contemporary French calf drawn over pasteboards; covers framed by a single gilt and two blind rules, oval gilt centre-piece on both covers, the spine divided into seven compartments by six raised bands and lettered Diver Dess (Divers Desseins) directly on the leather in the second compart­ment), the other compartments decorated by a small, gilt flower ornament; page edges stained blue. The designer’s intentions evidently were well-understood by craftsmen, as no piece of fur­niture built according to one of Du Cerceau’s designs is known. Elements of his designs can be detected in specific pieces.5 One of these is the famous table in the Withdrawing Chamber of Hardwick Hall, Derbyshire, which indicates that Du Cerceau’s patterns were available to English joiners and cabinetmakers as early as the third quarter of the sixteenth century.6 From the early 1580s, Du Cerceau’s furniture designs were diffused by others, notably Hans Vredeman de Vries (Differents pourtraicts de menuiserie, reversed versions of sixteen of Du Cerceau’s prints, published circa 1583),7 Crispin ii de Passe (Shriner Laden, published 1621),8 and Paul Vredeman de Vries (Verscheyden Schrynwerck, pub­lished 1630),9 and thereafter it becomes difficult to identify precisely the design source utilised by the craftsman. Some additional etchings of furniture, most judged by Destailleur and Geymüller to be of earlier creation, complete the corpus: a design for a domestic table (the aforementioned print dated 1550), a chair, a bench, two beds, three chimney-pieces, four carved or sculp­tured retables, and a wainscot panel. Du Cerceau’s designs for mirror frames, chandeliers, reliquaries and other ecclesiastical furniture, are considered separately, as objets d’orfèvrerie. 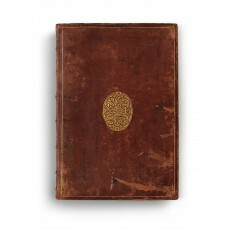 The Macclesfield album contains all forty-five prints of the Destailleur-Geymüller nucleus. All but one of these etchings were imposed in pairs: two matrices were inked and wiped, then laid out and printed on a single sheet of paper in one pass through the press.17 Occa­sional offsetting (folio 5 onto 4, folio 11 onto 12, folio 17 onto 18) indicates that the matri­ces were struck at the same time (offsetting occurs when printed sheets that are not yet dry are laid over one another). Paper evidence suggests circa 1560–1570 as the probable date of printing;18 other evidence proves that some matrices already had experienced use. A common feature of matrices produced in the Du Cerceau atelier is their swift deteriora­tion (through inexpert hammering, heavy use, or by mishandling), evidenced by the open­ing of cracks in the copper, steady diminution in size, ‘clipped’ corners, and so forth. The print on folio 3 of our album (conjugate with folio 6) retains its original corners, whereas the impression in the Musée du Louvre (Collection Edmond de Rothschild) is clipped, and thus representative of a subsequent issue.19 Since the print on folio 15 of our album (conju­gate with folio 20) shows a clipped corner, we surmise earlier usage of this matrice – and also of the other matrices producing the print series ‘Cabinets et dressoirs’. 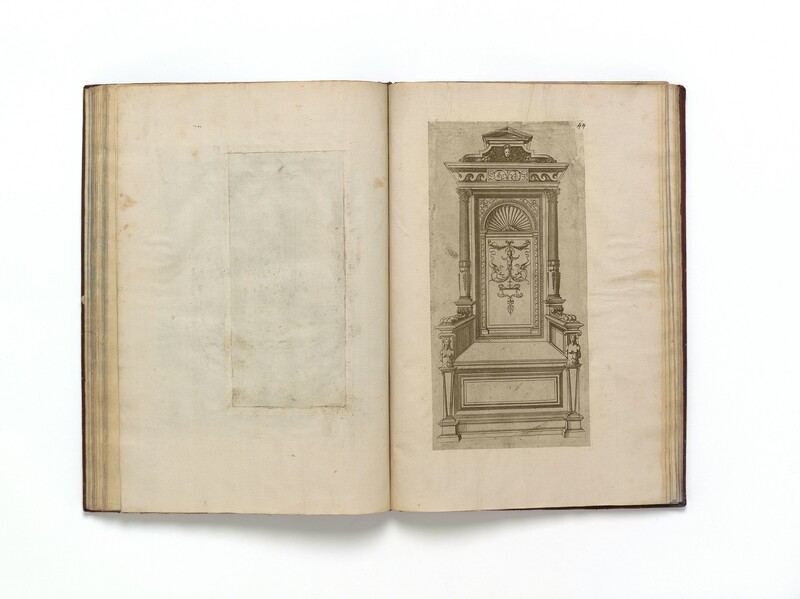 The great majority of Du Cerceau’s prints for furniture are preserved in modern assem­blages (recueil factice); very few survive in contemporary bindings, and the rediscovered Macclesfield album is certain to be useful in the difficult work of giving order to the states and determining issue dates. Interpolated in the Macclesfield album among the prints issued in the 1560s are twenty-nine prints of earlier conception and date of printing (printed on twenty-two folios),20 of which twenty are not models for furniture according to definitions of the genre favoured by Destailleur, Geymüller, et. al. Some of these twenty-nine prints were bound in the album on their own paper; the rest were mounted by the binder on stubs, or trimmed along the platemark and either inlaid in album sheets, or pasted onto them (once on a verso, folio 44). Several prints show a residue of glue on their versoes, evidence that they formerly were attached to supports, presumably leaves in a previous album. One of these early prints (folio 44) is presently known to Peter Fuhring only by the impres­sion in our Macclesfield album (see Fig. 6).21 It is a design for a high-backed chair, its back panel carved with grotesque ornament (after the models of Enea Vico, published 1541) and flanked by columns supporting a frieze, cornice and pediment. The hinged seat forms the lid of a storage coffer, the sides of which are carved with grotesque female terms.22 Another early print (folio 42) is a large bed ‘style Henri ii’; it is known to the writer only by a single impression once in the Fountaine and Foulc collections (and now unlocated) (see Fig. 5). Also rare, but surviving in multiple impressions, are the ‘Grand dressoir avec cariatides de femmes’ (folio 26) and ‘Grand meuble de cabinet à trois étages’ (folio 27). Among the twenty associated prints is a closed suite of twelve ‘Fleurons’ (printed on six sheets, folios 62–67), apparently conceived and first printed by Du Cerceau at Orléans in the 1540s. Six prints (from the series of twenty) of ‘Grands Cartouches de Fontainebleau’ and the ‘Deux Lucarnes’ (imposed together, folios 23–24) are of similar date. The clipped corners of the matrices of two ‘Fleurons’ and of one ‘Lucarne’ betray previous usage of these matrices. The binding evidently was made to safeguard these two groups of prints: one group newly struck, and bound in on their own paper (forty-four prints); the other group comprising prints published at earlier dates, probably obtained second-hand, and mounted in album leaves (twenty-nine prints). The covers of the binding are decorated by a blocked oval cen­tre-piece of interlacing strapwork (72 × 55 mm) of a type popular across northern Europe (including England) for at least thirty years.23 The watermark in the binder’s endpapers, an armorial surmounted by a crown, with a banner below, cannot be identified; the style sug­gests a date of circa 1570. At this date ornament prints were esteemed for their practical function and seldom collected for their qualities as works of arts and preserved in albums. Nonetheless, other albums are known, each to some degree unique in content and organisation, reflecting the circumstances of their sale – individually, or in small cahiers, according to the preferences of the purchaser. Abbreviated references are expanded in bibliography. 1. Charles-Moïse Briquet, Les filigranes. Dictionnaire historique dès marques du papier des leur apparition vers 1282 jusqu’en 1600 (Paris 1907), i, p.308: ‘J. Perret était sans doute un parent de son homonyme, Claude, qui, en 1559, exploitait un battoir à papier à Mallay-le-Roy, prés de Sens’; ibid., pp.314–315 for history of the mill. 2. fuhring 2002 p.47: ‘Il n’est pas aisé de mesurer le tirage ni la diffusion des planches de mobilier d’Androuet du Cerceau. Il existe aujourd’hui plusieurs exemplaires de ce groupe d’estampes, quel­ques-uns sont reliés avec parfois d’autres sujets ajoutés, mais peu d’entre eux conservent une reliure du xvie siècle. L’estimation du tirage est d’autant plus difficile…’. To the writer’s knowledge, no compa­rable album of Du Cerceau’s furniture prints has appeared on the market since the dispersals of the Destailleur (1895) and Lebeuf de Montgermont (1913) collections (see appendix other impressions). 3. Traditionally considered a lucarne (attic window), but regarded by Margaret McGowan, The vision of Rome in late Renaissance France (New Haven 2000), p.157 (reproduced), as a double-buffet. 4. Du Cerceau’s print of a ‘Cabinet au trophées d’armes’ (our folio 4; baldus no. 27, jervis no. 60) is the model for a binding in Biblioteca Reale di Torino; see Hector Lefuel, ‘Deux reliures du xvie siècle d’après Du Cerceau’ in Byblis 5 (1926), pp.139–146 (binding and print reproduced), and fuhring 2002 pp.49, 51 note 23 (print reproduced). 5. For examples, see Elisabeth Vadaszi, ‘Buffet ou dressoir? L’influence de Du Cerceau sur un dressoir de Budapest’ in Ars Decorativa 5 (1977), pp.17–39; Peter Hughes, The Wallace Collection: Catalogue of Furniture (London 1996), i, pp.64, 67, 75, 107; Jacques Thirion, Le mobilier du Moyen Age et de la Renaissance en France (Dijon 1998), pp.235–238 (‘Le Rôle des Gravures’) and passim. 7. jervis nos. 142–157; amsterdam catalogue no. 183 nos. 1–16; F.W.H. Hollstein, Hollstein’s Dutch & Flemish etchings, engravings and woodcuts, 1450–1700, xlviii, compiled by Peter Fuhring (Rotterdam 1997), nos. 491–507; Anja Grebe, ‘Die Möbelentwürfe von Hans Vredeman de Vries – Zwischen Schreinervorlagen und Sammlerwerk’ in Hans Vredeman de Vries und die Folgen, edited by Heiner Borggrefe (Marburg 2005), pp.109–117. 9. Hollstein/Fuhring, op. cit., nos. 624–663. 10. In an œuvre of hundreds of plates, Du Cerceau applied his name (or monogram) to only three; one is the print mentioned, lettered in the matrice ‘Pour une table a ralonger’ and ‘Iac. And. Dv Cerc Fac[iebat] Avreliae. 1550’. geymüller p.318 considered it independently of Du Cerceau’s other prints with models for tables. 11. Very few prints with models for furniture can be dated before 1550. The earliest were made in Germany circa 1525–1530 by Albrecht Altdorfer and Daniel Hopfer, with Peter Flötner, the Master hs and the Master hg also active there before mid-century. 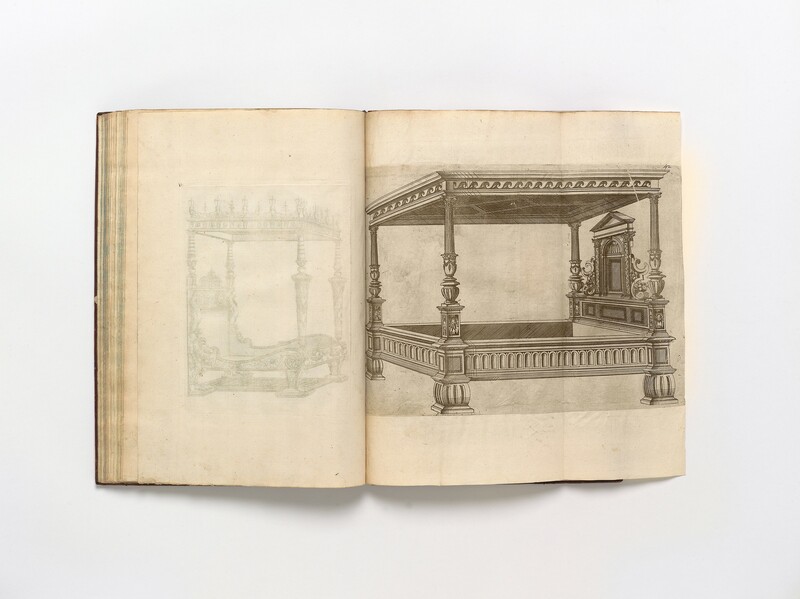 The earliest known prints of furniture published in France are two of beds by an anonymous master, one of which is lettered ‘Mvlta renas­centvr que nunc cecidere 1535’ (geymüller p.290, as by Du Cerceau; foulc sale lots 75b, 75c, as by Du Cerceau; fuhring 2002 pp.43–44, 51 figs. 3–4; fuhring 2016 p.790 fig. 22, as unidentified printmaker); nine prints of ecclesiastical furniture by the Master ia (Gisèle Lambert, Les premières gravures italiennes: Quattrocento – début du Cinquecento; Inventaire de la collection du département des Estampes et de la Photographie, Paris 1999, pp.437–441 nos. 798–806; see also byrne 1973 pp.143–149, fuhring 2002 fig. 6, fuhring 2016 pp.785–786); and seven prints of archi­tectural elements (with potential utility to woodworkers and sculptors) etched by the Master hs (Hughes Sambin?) and dated 1553 to 1560 (fuhring 2002 pp.47–48). A series of ten etched designs for cabinets by the Master Rb dating from 1572 is published by fuhring 2016, with brief discussion of some earlier prints, by Androuet du Cerceau and others. 12. destailleur, Notices, p.46; destailleur, Recueil, p. 14; geymüller pp.183–184, 289–290, 318–319. This combination of subjects occurs in several old albums, including the one owned by Destailleur (see appendix other impressions). The matrices must have been maintained as a group over time, as impressions on different papers are known (e.g. la sirène nos. 50–54, printed on stock manufactured by Edmond Denise, Briquet, op. cit., nos. 4432–4434). 13. guilmard pp.11–12 (fifty prints). 14. baldus passim (fifty-two prints). 15. jervis nos. 51–101 (fifty-one prints). 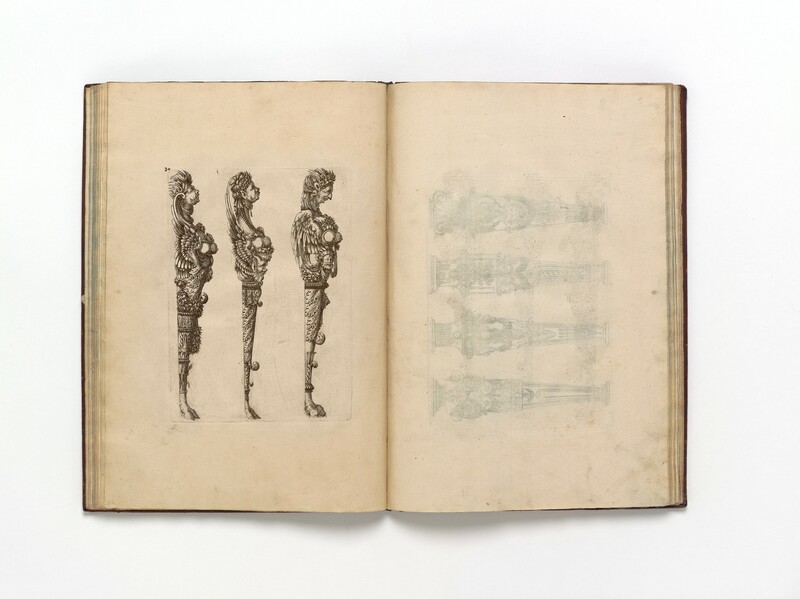 See also bryne p.110 (forty-five prints) and Marjorie Connell, in Designs of desire: architectural and ornamental prints and drawings 1500–1850, catalogue of an exhibition held in the Burrell Gallery, Glasgow (Edinburgh 1999), pp.82–83 no. 24 (fifty prints, ‘pub­lished as a coherent group c.1550/51’). 17. The forty-four matrices were not printed in the ‘suites’ constituted by Destailleur, Geymüller, Jervis, and others: a table (on folio 29) is imposed with a cabinet (folio 21), and the two ‘Portes’ (folios 12, 25) do not appear on the same sheet. It may be meaningful that both ‘Portes’ occur among the ‘Cabi­nets et dressoirs’, as does the single print of a chimney-piece (folio 20, imposed with folio 15). 18. All the matrices of this group are printed on a single paper stock, manufactured by J. Perret at Châlons, Mallay-le-Roy (Sens), documented by Briquet, op. cit., no. 5306: ‘Sens 1566’. By 1571, J. Perret had adopted a watermark of three linked crescents (Briquet no. 5375). It seems that Du Cerceau’s etched furniture designs continued to be printed after his death, by his sons Baptiste (died 1596) and Jacques ii (died 1614). A comprehensive investigation will likely prove the existence of many more reissues of the furniture prints than are now recognised. 19. jean-richard no. 88 (reproduced). 20. The chronology of Du Cerceau’s prints remains vexed. geymüller pp.183–184, 318–319, decided priority on stylistic grounds, without consideration of physical evidence. 21. furhing 2010 pp.54 fig. 52 (reproducing our impression), 55, 58 (note 96), 311 no. ME1 3; fuhring 2016 pp.785, 791 fig. 23 (reproducing our impression). 22. Similar armless terms, also beneath C-scrolls, appear in the drawing by Du Cerceau reproduced by geymüller pl. iii (between pp.120–121). 23. Werner Hohl, ‘Ornamentplatten’ in Gutenberg-Jahrbuch 1989, pp.324–329. 25. 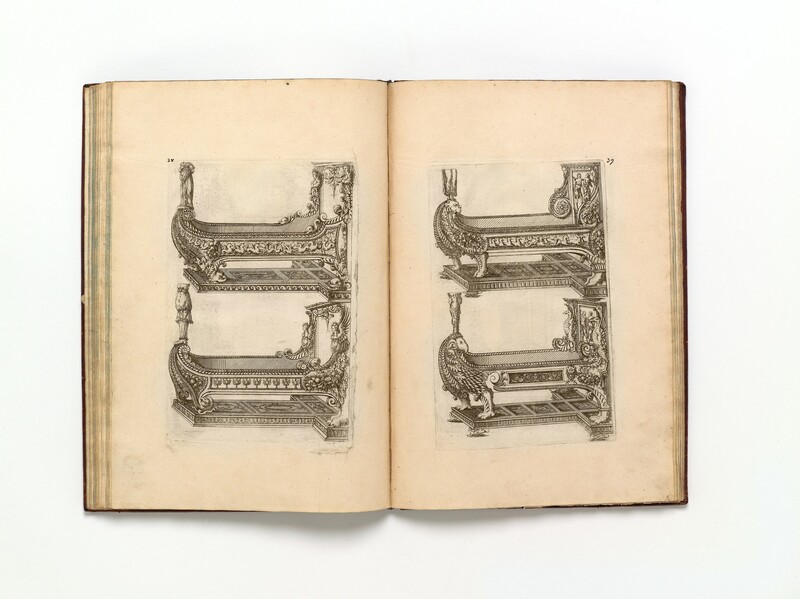 A group of forty-four prints of furniture designs (some cut in two), plus two plates of ‘Pilastres effilés vers le bas’ (geymüller p.319). Images at http://www.culture.fr. 27. ‘Designs for furnishings, including cupboards, sideboards, tables, beds, doorways, pedestals, caryat­ids, sphinxes, frames, and a chimneypiece. Plates (43) from a series’. Also ‘designs for caryatid and terminal figures. Plates (2, with 3 designs on each plate) from a set of 12’. Mounted in a volume, exlibris George Abraham Crawley (sold as the property of Mr. S.F. Colley Smith by Sotheby’s, 24 November 1960, lot 24). 28. A volume assembled by Edmund Foulc (d. 1916); see foulc sale lot 75, no. 39: a group of forty-six plates in a 19th-century binding by Thibaron-Joly. 29. geymüller p.184 (note 1): ‘un beau volume des meubles’ (not traced in library’s opac, unless contained in one of the two large albums factice from the Lesoufaché bequest, shelfmarks Est Les 16 and Est Les 17). 30. jean-richard p.64: ‘Recueil de 160 pl. [of various plates by Du Cerceau], reliure de Motte en maroquin bleu… Signatures de Guillois et L. Vaudoyer sur la page de garde’. 31. 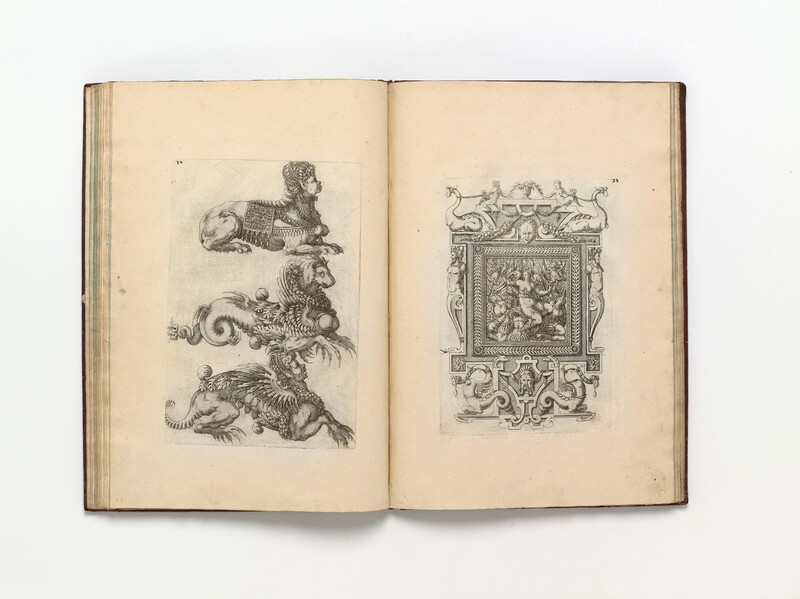 Includes designs for ‘Reliquaires, monstrances, fonds baptismaux, calice, retables ou cadres d’autel; 16 planches au trait, parfois rehaussées de lavis’ together with ‘Serrurerie: 21 planches’ and ‘Bijoux: 48 planches’ [E040433–040502]. Compare guilmard pp.15–17 and linzeler pp.65–67. 32. A volume assembled by the architect Antoine Callet (1755–1850? ), his sale ‘Catalogue d’objets d’art, antiquités, émaux; tableaux, dessins, gravures, livres à figures; manuscrits, qui composent le cabinet et la bibliothèque de feu M. Callet’, Paris, 26 February–5 March 1855, lot 381: ‘14 vol. Meu­bles. 45 pl. sans titre ni date, représentant des buffets, dressoirs, tables, lits, etc.’ Contents according to library opac: ‘Deux motifs de lucarne’ (baldus nos. 50–51) [E040216–040217], ‘Meubles (cabinets, dressoirs, tables…)’ (baldus nos. 1–10, 14, 18, 19, 25–37, 40–43) [E040218–040249], ‘Cathèdre (chaise de chœur ou chayère). Planche ombrée’ (baldus no. 44) [E040250], ‘Deux portes’ (baldus nos. 23, 24) [E040251–040252], ‘Lits droits ou en forme de bateaux’ (baldus nos. 11–16) [E040253–040258], ‘Panneau sculpté entre deux gaines, scène de bataille’ (baldus no. 49) [E040259], ‘Coffre (ou sarcophage, ou salière, ou baignoire), plus une reproduction par Pilinski’ (baldus no. 39) [E040260–040261], ‘Grande table “...a ralonger…” [E040262], ‘Banc avec accotoirs (reproduction par Pilinski), plus un calque’ (baldus no. 46) [E040263–040264], ‘Balustrades dites bordures (ou à tort petits nielles). 42 planches’ [E040265–040306], ‘Frises. Quatre planches au trait, rehaussées de lavis, offrent 13 motifs de frises’ [E040307–040310]. Cf. guilmard pp.15–17 and linzeler pp.63–64. 33. ‘29 Bl. Möbel: Tische, Kästen, Betten, etc.’ vienna katalog 1889 pp.150–151 (one plate illustra­ted). 34. ‘48. Bl. Möbel: Kästen, Betten, Tische, Kamine und A.’ K. K. Österreichisches Museum für Kunst und Industrie (Vienna), Illustrierter Katalog der Ornamentstichsammlung des Österreichischen Museums für Kunst und Industrie: Erwerbungen seit 1889, compiled by Franz Ritter (Vienna 1919), pp.136–137 (one plate illustrated). 35. ‘Catalogue de livres rares et précieux composant la bibliothèque de feu M. l’abbé Jean-Baptiste Chevalier de Bearzi,’ Paris, 31 May 1855, lot 1677: ‘Trente-sept planches de meubles d’Androuet du Cerceau. In-fol. cart. à la Bradel. Belles épreuves. Un des ouvrages les plus beaux et les plus curieux de Du Cerceau. Il est de la plus grande rareté’. 36. ‘Catalogue d’estampes et de livres relatifs a l’architecture et a l’ornementation… La Collection de feu M. Eug. Bérard, Architecte’, Paris, 16–20 February 1891, lot 451: ‘Meubles. Quarante-sept pièces, dont: dix-huit pièces, buffets, crédences, cabinets, etc. ; douze pièces, tables; six pièces, lits; deux piè­ces, portes; une pièce, cheminée; deux pièces, cadres; une pièce, chenets; trois pièces, gaines; une pièce, lucarne; une pièce, grande meuble de cabinet à trois étages; plus trois copies des pièces qui manquent’. 37. destailleur sale lot 289: ‘Meubles dessinés et gravés par J.A. Du Cerceau. S. l. n. d., pet. in-fol, vélin. Cette suite, une des plus remarquables de l’œuvre de Du Cerceau, comprend, d’après MM. Destailleur et de Geymüller (p.319), 45 pièces sur lesquelles nous n’en avons que 42. Cabinets, 20 ff. – Tables, 11 ff. – Chaise de chœur, 1 f. – Portes, 2 ff. – Lits, 6 ff. – Panneau et gaines, 1 f. – Cheminée, 1 f. Il nous manque 3 ff. de Termes et gaines, par contre nous avons en plus un Banc avec barres d’appui aux extrémités. Pièce non décrite. Très belles épreuves du premier tirage a toutes marges. Une pièce est remontée’. 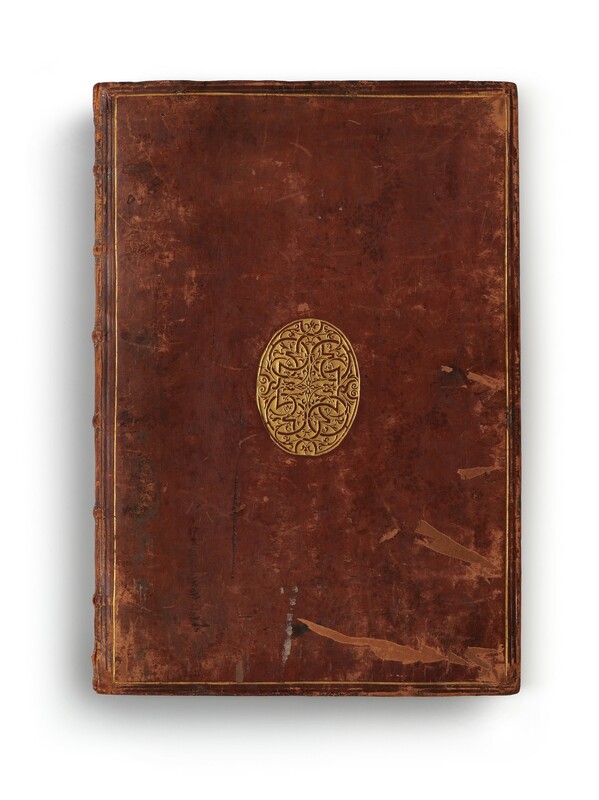 Bound circa 1576 together with other publications of Du Cerceau in contemporary vellum. 38. ‘Catalogue de livres d’architecture, de peinture, de sculpture et d’antiquités, faisant partie de la bibliothèque de feu M. Hubert’, Paris, 20 December 1841 (sale catalogue not located by the writer). According to Pierre François Defer, Catalogue général des ventes publiques depuis 1737 jusqu’ à nos jours. Tome i (Paris 1865), p.64 no. 28, one lot was ‘Buffets, dressoirs, tables, lits, etc. … 51 pièces’. 39. ‘Notice d’une belle collection d’ornemens de la Renaissance, gravés par d’anciens maîtres, prove­nant du Cabinet de M. de M…’, Paris, 1–2 April 1835, lot 98: ‘Meubles divers, dont les tables, pièces rares, par le même, 43 p’. 40. Répertoire méthodique de la librairie Damascène Morgand (Paris 1893), i, p.306, item 2074: ‘Recueil des Meubles, Termes, Objets de serrurerie, etc., dessinés et gravés par Androuet Du Cerceau. S.l. n.d. (vers 1580), en un vol. in-4, demi-rel. chagrin. 750 [Francs]. Très-beau recueil composé de 67 planches en excellents épreuves du premier tirage. Il renferme: 1° Cabinets, Dressoirs, 21 pièces sur 20 feuilles. 2° Tables, 24 pièces sur 11 ff. 3° Chaise de Chœur, 1 pièce sur 1 f. 4° Portes, 2 pièces sur 2 ff. 5° Lits, 8 pièces sur 6 ff. 6° Deux gaines et un panneau avec sculptures, 3 pièces sur 1 f. 7° Dessus de cheminée, 1 pièce sur 1 f. 8° 3 termes vus de profil sur 1 f. 9° Gaines ou scabellons, 8 pièces sur 2 ff. Au total pour la série des Meubles, 71 pièces sur 45 ff. ; cette collection est complète ainsi. 10° Lucar­nes, 2 pièces sur 2 ff. 11° Termes, 18 pièces sur 6 ff. 12° Sphinx et Chimères, 3 pièces sur 1 f. 13° Heurtoirs pour tiroirs et marteaux, 20 pièces sur 8 ff. 14° 3 fonds de coupe sur 3 ff. 15° 2 fleurons sur 2 ff. Ensemble 119 pièces sur 67 feuilles. Ces épreuves montées à châssis proviennent de la Bibliothè­que Nationale (Doubles échanges)’. 41. ‘Catalogue des livres manuscrits et imprimés, des dessins et des estampes du cabinet de feu M. Guyot de Villeneuve’, Paris, 26–31 March 1900, lot 230: ‘Recueil des Meubles, Termes, etc., dessinés et gravés par Androuet Du Cerceau. S.l. n.d. (vers 1580). En un vol. in-4, veau ant. jaspé (Rel. anc.). Très beau recueil composé de planches en excellentes épreuves du premier tirage. Il renferme: 1° Meu­bles. – Portes, 2 pièces sur 2 ff. Cabinets, Dressoirs, 21 pièces sur 20 ff. Deux gaines et un panneau avec sculpture, 3 pièces sur 1 f. Gaines ou scabellons, 8 pièces sur 2 ff. Sphinx et Chimères, 8 pièces sur 1 f. Dessus de cheminée, 1 pièce sur 1 f. Trois termes vus de profil, 1 pièce sur 1 f. Tables, 24 pièces sur 11 ff. Lits, 8 pièces sur 6 ff. Miroir, 1 pièce sur 1 f. (pièce en largeur). Au total pour la série des Meubles, 77 pièces sur 46 ff. 2° Détails d’ordre d’Architecture. S.l. n.d., 2e série, 20 planches. Ce volume appartenait à M. Piot… L’exemplaire est à toute marges et d’une grande pureté. Il est fort rare de trouver la suite des meubles dans une pareille condition’. 42. ‘Catalogue des Livres de la Bibliothèque de M. L. de Montgermont’ (sixth sale), Paris, 19–21 May 1913, lot 17: ‘Recueil des Meubles, Termes, etc. dessinés et gravés par J. Androuet Du Cerceau. S.l. n.d. (vers 1580), in-4, veau granité, dos orné, tr. peigne (Rel. anc.). Très beau recueil composé de 66 planches en excellentes épreuves du premier tirage. 1º Meubles, Portes, Cabinets, Dressoirs, Termes, Tables, Lits, Miroir, etc., 77 pièces sur 46 ff. Cette collection est complète ainsi. 2º Détails d’ordre d’Architecture. 2e série, 20 pl. L’exemplaire est à toutes marges et d’une grande pureté. Des bibliothè­ques de Eug. Piot et Guyot de Villeneuve’ (realised 3720 Francs to the Parisian bookseller Albert Besombes). 43. ‘Catalogue de feu M. A.V., architecte. Estampes, maîtres anonymes et à monogrammes. 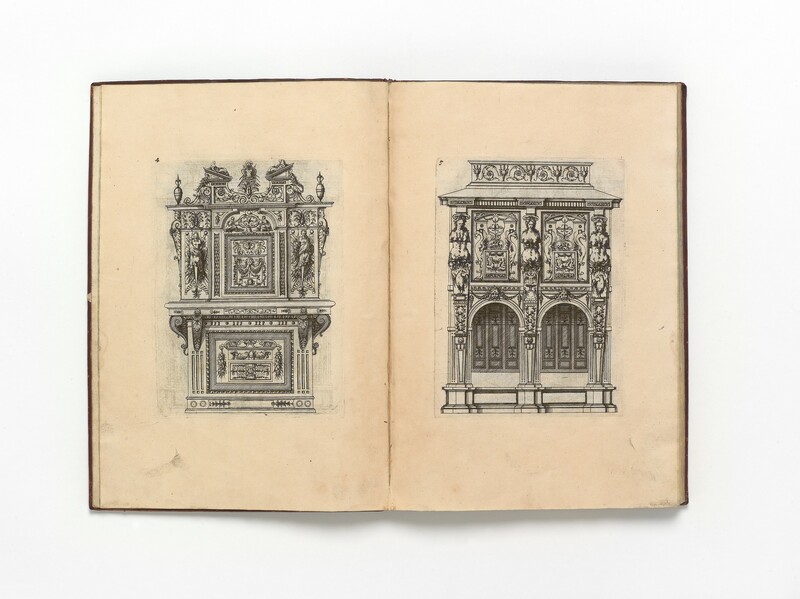 Oeuvres d’Androuet du Cerceau… Ornements… Livres à figures, architecture, littérature, beaux-arts & catalo­gues’, Paris, 16–18 July 1862, pp.10–11, about 45 prints sold in seven lots: lot 110: ‘Rétables d’autel 2 et 1 calque’, 111: ‘Lucarnes très-riches. Rare. 2 p’, 136: ‘Meubles, banc et siège épiscopal. 2 p. et calque de titre’, 137: ‘Tables 12 p. à 1, 2, et 3 motifs’, 138: ‘Armoires 7 p. – Dressoirs 4 p.’, 139: ‘Buf­fets, dressoirs 9 p. et 2 calques’, 140: ‘Lits 6 p. à 1 et 2 motifs’. For sale results, see Defer, op. cit., p.64 no. 28: ‘Vivenel (1862), 45 pièces, dont deux calques, en quatre lots, 1065 fr’. 44. Not identical with any of Du Cerceau’s twelve designs of Lucarnes appearing in his Second Livre d’architecture (Paris 1561).